Chicken and egg situation. Perhaps there are more pressing needs to upgrade the impoverished physical facilities of the Philippine public school system - classroom shortages, books, etc. The poverty of the Philippine school system, however, is but a component of the broader impoverishment that crushes Philippine society overall at all fronts. Therefore, the more fundamental question is: What is at the very root of this pervasive and profound impoverishment of the Filipino? ...(although I'd question whether these examples actually do capture the essence of the concept). We simply lack a *natural* ethic of efficiency in our undertakings. The road then leads back to the nature if the medium we choose to use to channel knowledge and ideas into the minds of our wretched compatriots. And again, I have to ask: Why Tagalog? "paulfarol: But not before other deficiencies. 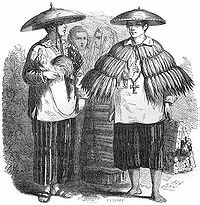 RT @benign0: Medium of instruction in Ph public schools is a fundamental issue http://t.co/vS7VuU1"
"My point is that the absence of a single Tagalog word for "efficiency" illustrates that this concept is *alien* or *not native* to Pinoy culture. This points to a possible reason why doing things efficiently does not come naturally to Filipinos." I'd beg to differ and with my meager observations on some mountain tribes, they have to make the most use of whatever resources they have and squeeze out as much as they can from the effort they make. That goes for land that they can plant on to the clothes they weave and the animals they hunt. This occurs also in coastal areas and flat lands too. Perhaps the concept of efficiency hasn't been distilled in a single word, but it is quite conceivable that without making efficient use of resources our ancient tribes would not have been able to have surplus that they could trade with. Maybe we can quibble further and say that perhaps we don't have a higher concept of efficiency or a more evolved implementation of the concept. But no matter, the idea exists and is applied by many, if not most, people here. Then again, perhaps, the problem is not efficiency but effectiveness. We can be efficient in something but if it doesn't achieve a desired goal, it may not be effective. He may be efficient in producing a certain product, but in a glut situation his efficiency won't guarantee him a good price for his product. Actually, I agree that teaching children in English may have better returns in the future. Teaching them Mandarin, French, Spanish, and Arabic will definitely give them an advantage later in life. But, the thing is, it's difficult to teach 100 kids at a time and it is difficult to learn while you're elbow to elbow in a hot, noisy classroom. If you can't get through this problem, you won't even get to the problem of medium of instruction. You will also remember that public education in the Philippines (1900s to 1939 and 1945 to 1960's) churned out a lot of pretty good students -- among them Juan Ponce Enrile and other leaders. The chief difference, perhaps, was that we had better teacher to student ratios as well as better teaching materials, facilities, etcetera. If the set up had been the same and we taught children in Tagalog/Cebuano/Ilokano, I think we'd probably see similar results -- granting we could translate scientific concepts and the like in these languages. It's not either-or. We can improve facilities and replace the medium of instruction with English. Every single word in Tagalog, to be frank, is actually borrowed from various languages, mostly from Spanish, Malay, Chinese, and English. Modern-day Tagalog, to be exact. Benign0, I concede the point. It's not either-or. Yes, doing both will have us reap double the benefits -- better facilities make better-motivated students and teachers; and a more deeply intellectualised language will make learning more efficient.